If you are an experienced webmaster or internet marketer who requires a reliable web hosting company with excellent support, PacificHost is probably not your best choice. We had issues that began with their billing department which had problems crediting our PayPal payment and took down our site. Twice. The support department was slow to respond to our assistance requests. While the renewal rate is only $4.99 per month, the average-at-best technical merits, combined with substandard billing and support services, indicate that PacificHost is not a good choice for low-cost hosting services. On balance, PacificHost has earned the NCM Online designation of NOT RECOMMENDED. Not the most widely known website hosting company, PacificHost offers fully-featured low-cost hosting plans. In our opinion, they do not merit consideration from internet marketers and professional webmasters. PacificHost offers a range of affordable shared web hosting plans: Basic, Advanced and Ultra. All include a 45-day money-back guarantee and a 99.9% uptime guarantee. The cheapest of the 3 plans is the Basic. It allows for up to 5 domains on a single account. Like all PacificHost shared plans the Basic includes unlimited Raid-10 disk space, unlimited premium bandwidth, unlimited subdomains, and unlimited parked domains. The plan also includes up to 25 email accounts, 25 MySQL databases, and 25 FTP accounts. While the $4.99 per month renewal rate for annual plans is certainly cheap, our speed and uptime testing confirm that the quality of the plan is only average. Low-cost add-ons include a dedicated IP address for only $2.00 per month (most hosts charge more); while an SSL certificate will only set you back $24.99 per year. Softaculous WordPress installation form. Click to enlarge. The Advanced plan includes all of the Basic plan’s features and options while allowing for an unlimited number of domains on 1 account, up to 250 email accounts, up to 250 FTP accounts, and up to 250 MySQL databases. The Advanced also provides the ability to share an SSL certificate as well as monthly and quarterly payment options. The Ultra plan is designed for ecommerce sites. While it is the most costly of the 3 shared plans, it adds a number of important features valued by ecommerce webmasters. These include a dedicated IP address, SSL certificate and site seal as well as the ability to host Magento‘s popular ecommerce solutions. The Ultra includes all of the Advanced plan’s features while adding the ability to create an unlimited number of email accounts, FTP accounts, and MySQL databases. In addition to shared Linux hosting, PacificHost offers business-class plans, VPS (virtual private server) plans, dedicated server plans, and reseller hosting plans. 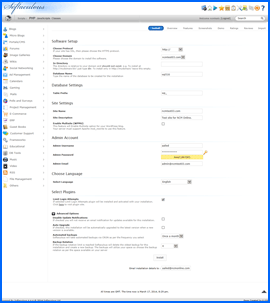 To enhance ease of use, PacificHost includes the popular cPanel control panel and the Softaculous 1-click script installer (screenshot above right) with all three shared hosting plans. However, we did encounter issues responsible for their decidedly average 2.5-star ease-of-use rating. The billing department had trouble crediting our PayPal payment. Attempts to reach them during non-business hours proved futile. Even though payment had been made, they took down our test site. We, not realizing that PayPal had actually confirmed our payment, paid them again. Realizing their error, they provided a refund. However, two days later they took down our site again for non-payment. Again realizing their error, they apologized, reinstated the site again, and gave us a 1-week hosting credit to be applied at the end of the current plan term. Not a great experience. PacificHost Uptime Test Results Chart. Note that testing was delayed until billing issues could be settled. Click to enlarge. From our experience with PacificHost, it appears that new accounts are manually approved. So if you place your order during non-business hours, you may experience a temporary delay in receiving all of the new account information. We placed our order on a weekend, and while we did receive the client portal login information immediately, the direct cPanel access, FTP login, and nameserver (DNS) information did not arrive in our inbox until Monday. If you need to get your site online in a hurry, we would suggest that you place your order during business hours. It should be noted that while PacificHost provides 24/7 email support, phone and chat support are limited to Monday thru Friday, 7AM-3:30PM PST. PacificHost Speed Test Results Chart. Click to enlarge. All web hosting services reviewed by NCM Online are purchased and subjected to our 10-day test for uptime and speed. Tested for uptime every 15 minutes over 10 days, PacificHost produced a 99.6191% reliability score (screenshot above right). On 3/12/14, the server began having problems as attempts to access our test site failed repeatedly. The downtime lasted approximately 50 minutes. 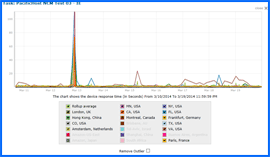 In all, we recorded 32 DNS 12007 errors (the host name could not be resolved). While no further server issues were detected for the duration of testing, the damage had been done. 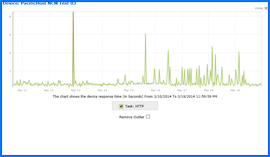 The downtime negatively impacted the page-load speed averages. PacificHost recorded an average speed of 2.6956 seconds to load our test site from 13 locations worldwide (screenshot above right), and 2.8825 seconds from 7 U.S. locations (click for sample test site). It is worth noting that had we begun our testing on 3/13 — after the uptime issues had subsided — PacificHost would have recorded an average speed of 1.3727 seconds to load our test page from 13 worldwide locations, and 1.3211 seconds from 7 U.S. locations. PacificHost provides average-at-best web hosting technology combined with substandard support and billing services at an affordable cost. There are better hosts in the same price range. PacificHost has earned 3.5 stars and is not recommended by NCM Online. Cheap website hosting company price comparisons based on 1-year term list price before coupon/promo codes or limited time/introductory offer discounts. These are the renewal rates for the second year of hosting. To ensure that you receive the most affordable PacificHost pricing possible, please visit our Web Hosting Coupon Codes page for current discounts and special offers before making any purchases. PacificHost specializes in website development and e-commerce solutions for enterprises that are small to medium in size. In order to cater to clients’ needs, the company employs staff members that are more than qualified. They provide only the best, feature-rich web hosting services. PacificHost has a pledge, which is to provide customers with only the best services at fair prices. They are constantly upgrading their software in order to provide even more services. They believe that everyone should have the chance to create a successful web presence at an affordable price. The company has ready solutions that will allow both small and medium-sized businesses to gain advantages with their websites. It is important for businesses to be able to take advantage of everything that the World Wide Web has to offer. PacificHost mobilizes businesses, as well as individuals to get the most out of the internet by providing them with affordable solutions that are very effective. They always strive to provide their customers with the utmost satisfaction. The company also strives to offer services that are the best in the industry, as well as strive to provide quality and knowledgeable customer support. They have a missions and that mission is to provide simplified web hosting services, while meeting the needs of webmasters that have a lot of experience. The firm is also confident in providing a wide range of value-added services, scripts, free tools, hosting solutions and helping businesses more forward in the ever changing global economy. The company has datacenters in quite a few different places, including Irvine and San Diego, CA, Las Vegas, NV, Denver, CO, and Hawthorne, CA. Peer’s SuperNetwork is the host to the company’s operations, and SuperNetwork is powered by Cisco and Juniper technologies. The network is considered self-healing, which means that there are no black holes or failure points within it. Network redundancy is ensured due to multiple Tier III connections. Also, Juniper routers are what the network is setup on. The routers direct traffic with Cisco 6500 series switching platform, and that traffic goes over a private fiber optic network. It is also worth pointing out that network latency is reduced by a further 50%. When you decide to host your server on the exclusive SuperNetwork by PacificHost, then you will realize that you will have access to high performance on a continued basis, and you will noticed reduced latency all at lowered costs. This all means that you will be able to enjoy the best website hosting experience. If you are ready to find out more about PacificHost and what they can offer you and your business, then contact them today and explain to them what your business needs are. A customer service rep will be more than happy to answer any questions you may have about the company and the services that they offer. Contact them today and find out what makes them the best in the industry. This video tutorial demonstrates the installation of WordPress on a PacificHost shared hosting account using cPanel and the Softaculous 1-click installer.